Thanks largely in part to the Internet -- think YouTube tutorials, Instagram how-tos and tons of product reviews -- you're pretty savvy regarding all things beauty. But while mastering the perfect cat eye is as simple as tuning in to a one-minute video, getting great skin requires a long-term commitment. Your skin starts out close to perfect -- hydrated with great elasticity, wrinkle-free and, of course, smooth as a baby's ... well, you know. Though your genetics are responsible for things like pore size, skin tone and skin sensitivity, plenty of other offenders can cause your skin to act up. For instance, a rise in hormone levels can bring on breakouts no matter what type of skin you have, and the sun shoulders most of the blame for wrinkles. News flash: Age spots have nothing to do with your age and everything to do with sun exposure. These permanent pigmented marks are the result of skin that has been repeatedly bombarded with ultraviolet rays. So whether you're celebrating your 18th birthday or your 30th, the only way to prevent age spots is with daily sun protection in the form of -- you guessed it -- sunscreen. You can't go wrong with a sheer lotion like Advanced Suncare Silky Sheer BB Face Lotion 50+. You probably know by now that you shouldn't pick a blemish. Unless you're employing a surgical-style hand-washing regimen, your fingers are likely spreading harmful bacteria to other pores and creating even more blemishes. However, keeping your skin clear goes beyond just washing your hands. Brace yourself -- what you're about to read may rock your world. Between texting, tossing it from purse to purse and shoving it in the pocket of your pants, your phone is a major source of bacteria. The last place it belongs is near your face. An easy solution: Invest in a great pair of headphones. Because the size of your pores is determined by genetics, you can't physically shrink them. That's the bad news. The good news is that you can help prevent them from getting larger and even help make them appear smaller. Cleansing your face regularly with an exfoliating wash will help keep pores dirt- and oil-free -- clogging is the main culprit of stretched-out pores. The best way to help minimize the appearance of your pores is with a topical treatment. Look for a lightweight cream with perlite (an ingredient that helps absorb oil) and a high concentration of Perline-P (an ingredient that strengthens the pore walls). Our favorite is Youth Code Texture Perfector Pore Vanisher. Revamp your diet to include foods that will boost your anti-aging efforts. 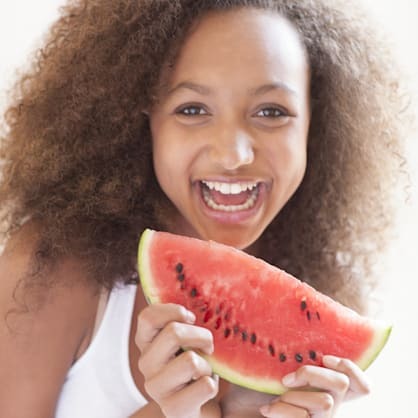 Watermelon and mangoes are high in carotenoids, which help guard against sunburn. Blueberries are a natural antioxidant and will help protect you from premature aging. Wild salmon (not farm-raised) is another wonder food. Rich in omega-3 fatty acids, it will help keep your skin supple and moisturized. Now that your skin care regimen is set, check out the tools you need to enhance your summer glow. Source: The Beauty Diet: Looking Great Has Never Been So Delicious by nutritionist Lisa Drayer, M.A., R.D.